This futon mattress and frame offers a sturdy and stylish design that can be converted from a sofa to a full-size bed. It comes with a sturdy metal frame, sleek wooden arms, and supportive, 6-inch coil mattress. Assembly is quick and easy. It’s heavier than expected—102 pounds—and some users have complained about how difficult it is to convert the bed back to the sitting sofa position. This modern leather futon bed is a multifunctional piece that offers style and comfort at an affordable price. Instructions and assembly are very easy to follow—it comes in one whole piece which folds out. Velcro fasteners on the underside of the futon hold it together while it’s folded. Because this futon is a bit firm, it’s not the most comfortable to sit on for long periods of time. It isn’t as stylish as others, but it provides economical design and comfort. It’s great for apartments, guest rooms, and dorms. It contains more than 50% of pre-consumer recycled content, making it the best futon for the environment. Some futon reviews mention that the seat and back are the most tedious parts to put together. 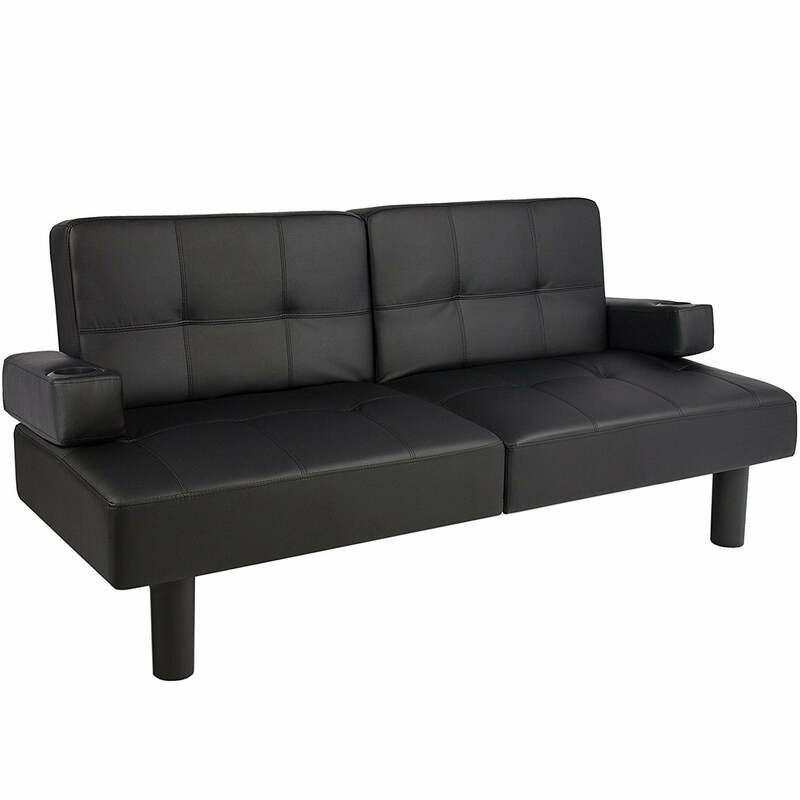 Made of smooth, easy-to-clean faux leather, this piece is simple and contemporary. The piece easily passes as a quality leather couch and converts from a sofa to an oversized twin sleeper with a 5-level recline. It’s not the most comfortable bed for sleeping, so if you need a futon for an overnight guest, opt for one with more cushion. 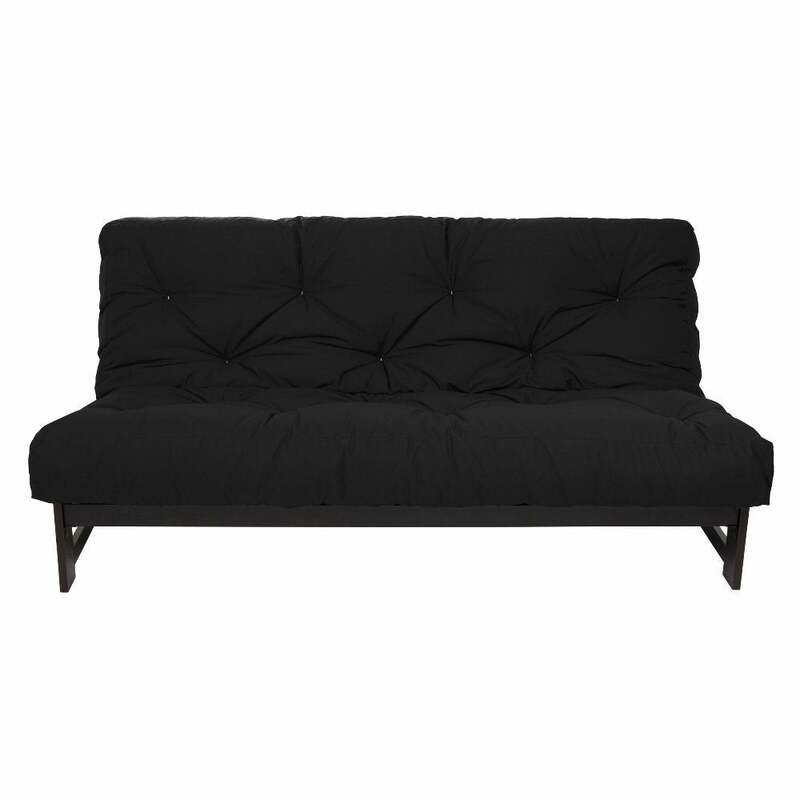 This basic futon fits any standard size frame and is made to be used in an upright sofa position or flat bed position. Made from high-quality, dual-sided memory foam and polyester, this futon is covered in cotton twill and comes in a variety of colors. The frame is sold separately and the fabric may give off a strong odor (similar to wall paint). Buying any type of furniture is a big investment. That’s why those of us at House Method test and review the furniture for you. We understand the importance of wanting to find a comfortable, affordable, and stylish futon, so we brought in products to test in our Research Lab and turned to plenty of futon reviews to determine which ones checked all the boxes. Traditionally, the term futon refers to the Japanese bed that consists of a padded mattress, comforter, and pillow. In the western hemisphere, a futon is often thought of as a covered, dual-purpose mattress that’s supported by a wooden or metal frame. Similar to sleeper sofas, futons are lighter, more affordable, and offer far more customization options regarding comfort and style. Because these pieces are so multifunctional, they can complement almost any type of space, including apartments, studios, guest houses, and bedrooms. So, how do you determine which futon is right for you and your home? Not only do you have to think about the frame, cover, and mattress, but you also have to consider what type of style you prefer and what accessories you want. Since there are so many futons available—and multiple factors to consider before you buy—the House Method team decided to make your purchase decision as easy as possible. We bought, tested, and reviewed the best futons on the market. We strive to give accurate, honest, and unbiased information and product recommendations, so you know exactly what to expect when you buy a futon. There are two common configurations: bi-fold and tri-fold. Bi-fold frames are the industry standard—they have arms and legs like regular sofas with a cushion that folds down the middle. These futons typically have a system of rollers to simplify the folding and unfolding process. Some bi-fold futon frames are called “wall-hugger” frames because they pull away from the wall when they fold down, preventing you from moving the entire frame to transform your futon into a bed. Tri-fold frames were the first type of futon frames on the market—they fold three times instead of two. Unlike most sofas, futons usually have an exposed frame. The frame supports the mattress in the extended sleep position and the folded sofa position. Most frames are either made of wood or metal. Wooden frames are typically made of high-quality timber, which makes them more expensive than metal frames. They come in a variety of attractive woods and finishes, like stained cherry and varnished maple, and do a great job at complementing existing décor. Metal frames typically cost less than wooden frames and are extremely sturdy. 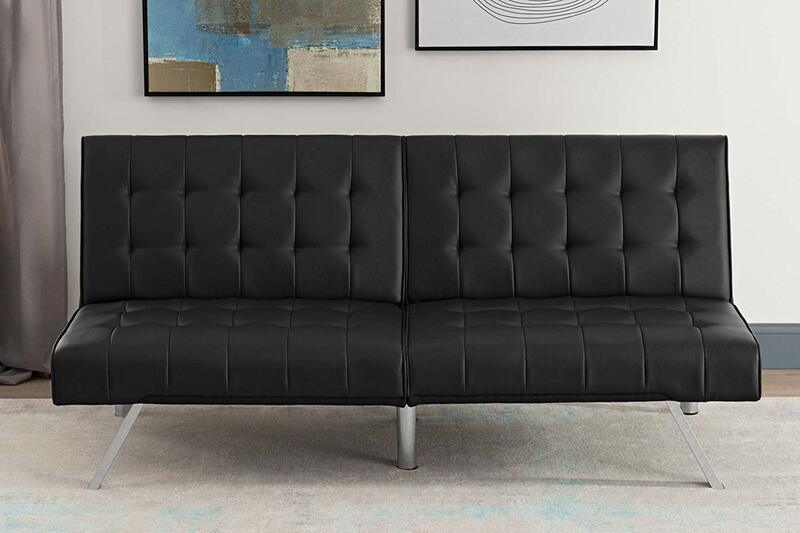 If you’d rather not put an entire paycheck toward a futon, one with a metal frame is an affordable choice. Some materials offer more comfort and firmness than others. Here are the most popular types of futon mattress fills. Memory foam—This fill is considered the gold standard for futon beds. It’s one of the most comfortable types available, offering lasting support. The downside? Memory foam futons are some of the more expensive mattresses on the market. They also sleep hot. Cotton—Cotton-filled futon beds are an affordable choice. They’re lightweight and firm, but they don’t provide the same comfort quality as foam or spring mattresses. Cotton is naturally hypoallergenic, so it’s a good choice if you or a frequent houseguest suffers from allergies. However, cotton is known to wear down faster than other types of materials. Foam and cotton—This mid-tier mattress fill is the most common. Foam and cotton blends are more supportive, comfortable, and longer-lasting than regular cotton mattresses. However, they’re not as comfortable as foam futons and are slightly more expensive than cotton. Foam and polyester—This blended fill lasts longer than other mattresses. Polyester is used as the top layer to make the mattress medium-firm and is more durable and water-resistant than other materials. Spring—Made with metal coils covered by a quilted layer, spring futons ensure that your mattress stays firm and comfortable. Note: a spring mattress can be heavy and quite difficult to fold. Innerspring—These futon mattresses resemble mattresses used on beds. The innerspring coils offer additional cushioning, relieving any pressure your body may experience. Wool—Wool-filled futons are great at regulating temperature, so they keep you cool in the summer and warm in the winter. 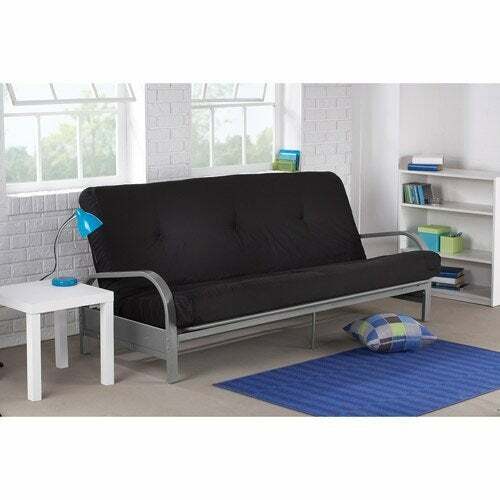 Futon covers slip over your futon, protecting it from spills and general wear and tear. If you happen to spill something on the cover, simply slide it off and wash it. A futon cover isn’t necessary, but it’s a great option for those who are worried about their mattress getting dirty over time. Before you purchase a futon, measure your space accurately to ensure your futon can fit in the space (folded and unfolded). Futons are available in twin, full, queen, and king sizes. Think about how you want to use your futon. Is it going to be used for sitting, sleeping, or both? 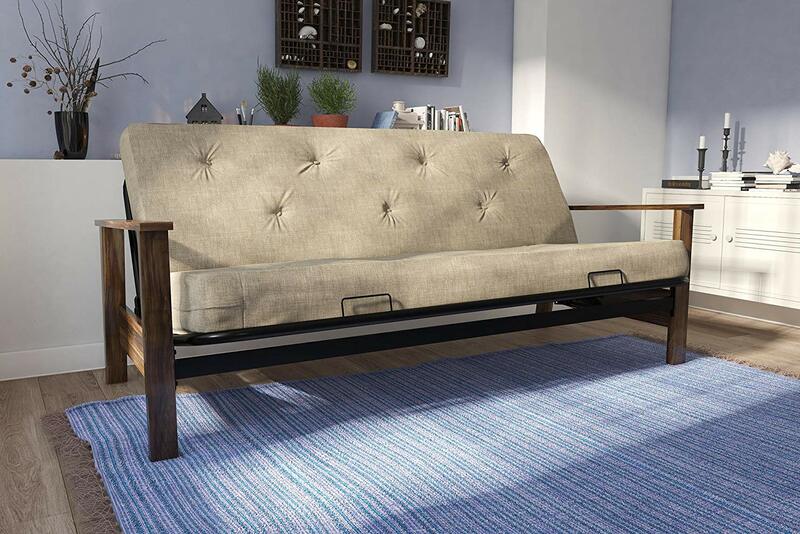 If you want to switch back and forth between a sleeping surface and seating, choose a bi-fold futon with a slider. The higher quality futon mattress you buy, the longer it will last. Some futons can last up to 20 years. To protect and care for your mattress, consider investing in a futon cover to protect it from normal wear and tear. For optimal comfort and support, buy a futon with innerspring coils—this type of mattress offers the highest level of comfort, similar to that provided by a regular mattress. Which futon is most comfortable? The best futons that offer maximum levels of comfort are ones that are made of innerspring or memory foam. The DHP Bergen Wood Arm Futon includes a six-inch coil mattress in linen upholstery and is the most comfortable futon we reviewed. How do you clean a futon? If you have a futon cover on the mattress, remove the cover and throw it in the wash. If your futon isn’t covered, you can deodorize the futon by sprinkling baking soda over an unfolded mattress and let it sit for about an hour. You can use a hand vacuum to remove the baking soda and any other debris that’s collected along the seams of the mattress. If you notice any stains, use a damp washcloth, mild laundry detergent, and warm water to gently blot the stains out. How thick should a futon mattress be? The best futons should be at least five to six inches thick. If you want a higher quality futon mattress with more padding, look for one that’s between eight and 10 inches. The Mainstay futon has nine inches of padding and contains more than 50% of pre-consumer recycled content, making it the best futon for the environment.